Events are a great way to market your product or service. In another post, we’ll discuss marketing your own events. This blog is about getting the most out of events you attend. It is a simple formula of marketing before, during, and after the event. Learning the ins and outs… better to have a booth in the main room, by the restrooms, in the concourse, or not at all? By being an attendee, you’ll increase your chances to successfully engage prospects if you do display at a future show. Walking around a show as an attendee will help you to understand how the show is unique, and how it is similar to other events. There may be things you want to do exactly as you always do – display, handouts, etc. Or there may be a different vibe to the show that gives you an idea for a new contest, giveaway, survey, or another engagement tool. Success for the “walkabout” would be meeting one prospect. It happens… I’ve done it, and I’ve had clients who’ve done it. By simply walking a show floor and talking to people they meet, a new connection forms that can grow into a prospect and then a customer. The power of having an attendee badge and not a presenter badge is in that you’re on the “same side of the display” as other attendees. Trust me, it won’t be a waste to attend before you display. It is paramount to know who is coming to an event. In the walkabout/attend-only year, ask the event promoter to provide a list of attendees. Not the published brochure list or logos, but an actual attendee list. You want to see who attends (and who displays) by title and company. This gives you a couple advantages as you prepare for the next event at which you may be a presenter/have a display. First, you’ll have insight as to whom you are marketing, which can inform which messages and products you highlight at the event. It also gives you a way to make the event more than a shot in the dark. Make the attendee list for the following event part of your negotiation for taking a display space. It isn’t always possible to obtain but negotiate for it. You will get much more out of the show if you know who is coming. When marketing at an event, make some part of the show by invitation only. Use the attendee list provided to invite customers and target prospects to a special presentation. Back in the day, off-site hospitality rooms were a mainstay. That works, but can be expensive and aren’t necessarily attractive to prospects who have a heavy work schedule and need to use their evenings to catch up on email and other tasks. Rather, consider what can be done to invite special prospects and customers to an informative special event. It could be on the display floor, during regular show hours. Or a breakfast meeting before the event begins. Make it focus on helping the prospect with their job… after all, that’s why they are attending the event. Such an event could be a Q/A with an industry expert (who could be from your organization) or a panel discussion on a hot topic. If doing the “event within an event” on the display floor, close your booth and post a staff person in the aisle to answer questions and engage people who will stop to look and listen. Nothing gets interest piqued like an event from which I am excluded! Collect names of interested passers-by for follow up and an invitation to a similar event via webinar in the future. To maximize your marketing at an event: follow up. It is difficult, especially with multi-day events. When back in the office, there are old tasks waiting for completion, new tasks that are coming, plus event fatigue… we naturally want to move on to something different. Schedule time to consistently work through the follow-up items. Send quick emails to thank people who inquired or attended your invitation-only event. Provide a timeline to them for expected follow up. Don’t immediately dump a ton of information on a prospect. They have all the same time and energy constraints you have when returning from a show. A quick email and a promise to be in touch can be the best communication received. As a marketer, it is also your job to make sure that messages delivered – including promises at events – are true. Don’t dump a list on sales and wash your hands. Follow-up internally to make sure that information is delivered, contact is made, promises are kept. If successful in these areas, consider going back. If not, perhaps other marketing tactics are a better spend. Events can be powerful marketing tools, but like all marketing, need a plan for before, during, and after the event. Planning makes marketing work. Even genius! 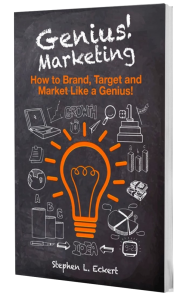 Need a primer on marketing planning? Buy the book Genius! Marketing. Considering marketing through an event? Contact us if you have questions or need help building a winning event program.